According to the latest veterinary surveys, more than half of our nation’s dogs and cats are overweight. This means almost 90 million pets are at a higher risk for developing arthritis, diabetes, heart disease, high blood pressure and some forms of cancer. So how can you slim down your super­sized pet? The answer may be easier than you think. 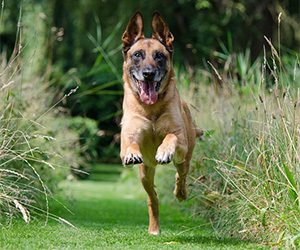 These five tips can help you trim excess pounds off your pet and keep her healthier. If you don’t know how many calories your pet needs each day, you don’t know how much food to offer. And don’t think you can trust the bag — feeding guidelines are formulated for active, adult, unspayed or unneutered dogs and cats. This means that if you your pet is an older spayed or neutered indoor lap lounger, you are likely overfeeding if you’re following the manufacturer’s instructions. Instead, ask your veterinarian to calculate the number of calories your pet needs each day. Or use this formula: Divide your pet’s weight in pounds by 2.2. Multiply that figure by 30. Then add 70. This number will give you a good idea of how many calories a typical inactive, indoor, spayed or neutered pet needs. Of course, each pet’s metabolism is different, so consult your veterinarian before starting your pet on a diet. Your greatest tool in the fight against a pet’s excess weight might be your measuring cup. Too many pet owners simply fill the bowl or guesstimate how much they’re feeding. Studies have shown that feeding as few as 10 extra kibbles of food per day can add up to a pound of weight gain in a year for indoor cats and small dogs. Keep in mind that for the average 10-pound cat or small dog, this is a 10 percent weight gain. After you calculate how many calories your pet needs, determine how much food you should feed at each meal — and measure it. We’re not against treats; we’re against junky treats. Too many pet treats are calorie grenades laden with sugar and fat. If you’re going to give your pets extra goodies, choose lower-calorie options. As an alternative to highly processed store-bought treats, try ­offering dogs baby carrots, green beans, celery, cucumbers, sliced apples and bananas, and ice cubes. For cats, try a flake of salmon or tuna. While you’re at it, put down the potato chips and share a veg with your pooch. You’ll both be healthier for it. Whatever treats you give, be sure to count those calories. Many pet owners feed the proper amount of food but sabotage their efforts by adding treats throughout the day. As few as 30 extra calories per day means your pet may gain three pounds in a year. For dogs, as little as 20 to 30 minutes of daily brisk walking may be all it takes to boost immune function, improve cardiovascular health and burn calories. For cats, try playing chase (using a laser pointer, remote-controlled toy or ball of paper) for five to 15 minutes each day. As a pet owner, it’s your responsibility to help your cat or dog maintain a healthy weight. Even though she might love eating snacks and table scraps every day, you know that’s not smart. It’s up to you to feed healthy, nutritious foods and treats and to exercise your pet daily. By using these simple suggestions, you’ll be on your way to your pet’s best — and healthiest — year yet.